Monolith Resort is located amidst verdant mountains offering the best possible view of the picturesque Bhimtal. A steep driveway from the bus stand of Bhimtal will bring you to the Monolith Resort. The resort is well equipped with modern amenities and charges less than what it serves. The resort ensures esteemed comfort level and a memorable stay to its guests. Named after the famous solitary rock which is typical of the Kumaon belt, Monolith Resorts manifests the inexplicable charm of Bhimtal (Uttarakhand, India) .The Resort is located just above the lake giving a breathtaking view of the entire town. Monolith resorts has been uniquely designed to amalgamate the verdurous mystery of nature and the ingenuity of modern architecture. Monolith Resort has been honored by Indian Architecture Award. 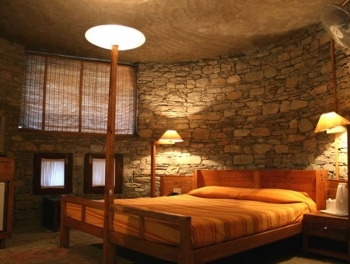 The structure of Monolith Resort is mainly made by rocks and wood giving it an eco friendly look. The sit out areas, swimming pool, machan and indoor games adds charm to your stay. Some portions of the movie, Koi Mil Gaya were shot in this resort. This place is loved by many film stars of India including Hrithik Roshan, Preity Zinta, Bipasha Basu, Karishma Kapoor and Suniel Shetty. It is an ideal place to visit throughout the year. Monolith Resort acts as retreat in summers, during monsoons you will fall in love with the misty mountains and greenery, and in winters the region receives snowfall. Monolith Resorts is situated amidst lush green surroundings with captivating view of Bhimtal. Strategically located 2 kms from the Bhimtal bus stand and 22kms from Kathgodam, Bhimtal offers serenity at its best. The distance from Delhi to Monolith Resort is approximately 300kms. Monolith Resort serves with various elegant accommodation such as Luxury cottages, Independent cottages and Lake View rooms. The rooms are equipped with telephone, mini bar, air conditioned, satellite TV and attached sanitized bathrooms. The luxury cottage also comprises of mini refrigerator and room service. The multi cuisine restaurant of Monolith Resort offers invigorating view of the emerald Bhimtal. Delicious and healthy food is served in this open air restaurant of Monolith Resort. Sturdy stoned pillars support the shed roof over the tables. The hotel also offer marriage/ party/ function/ contest/ conference/ seminar arrangements with catering, music, indoor / Garden space & accommodation facilities. Just let us know your program and leave all the arrangements on us. - Free Use of In-House activities. 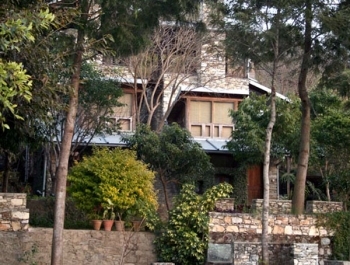 BY ROAD: Monolith Resorts in Bhimtal is well connected by road From all part of the country.